Matt McGrew is general manager of the RSS Roofing Services & Solutions facility in Nashville, TN; the company is based in St. Louis, MO, www.roofingsands.com. Ensure that the jewel orifice and nozzle body are properly aligned. And, after every 8 hr. of cutting, rotate the mixing tube 90 deg. This will avoid uneven wear, help minimize tapering and extend mixing-tube life. 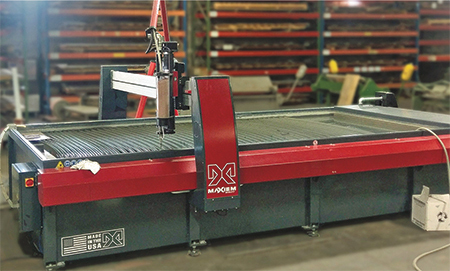 Waterjet-cutting system can process a variety of materials using a very high-pressure jet of water. This style of cutting is preferred when the materials being cut are sensitive to high temperatures generated by other processes, allowing for the material to keep its inherent structure. For example, glass, rubber, stone and metal alloys such as copper, titanium and stainless steels often are cut with waterjet systems. The process can achieve dimensional accuracy of ±0.005 in., with repeatability of ±0.001 in. over an entire work envelope. And, the use of the supersonic water stream means that blades never have to be sharpened and environmental factors such as dust and toxic fumes are greatly reduced compared to other cutting processes. Improper maintenance of waterjet systems can cause inaccurate production, increased use of consumables and, most importantly, machine failure. Using more water and the purchase of replacement parts will drive up costs to maintain the equipment. And, operational downtime and inaccurate part dimensions can result in the loss of business. Most waterjet-system manufacturers suggest cleaning the equipment after each use or at some specified interval. Repairs and maintenance procedures should be conducted in a clean environment. Preventive-maintenance software is available, and strongly recommended. The software monitors operating conditions such as high-pressure plumbing, pumps, filters, abrasives and water-tank levels. It tracks operating hours of the components and will send alerts when components come due for maintenance or replacement. Each waterjet system comes with recommended manufacturer maintenance procedures. It is vital for operators to become familiar with the machine manual and routinely follow recommended maintenance steps. Failure to properly clean and maintain the equipment can have a devastating effect on the product being cut and will lead to higher maintenance costs, as well as possible loss of business due to failed equipment. Shop employees should complete equipment-manufacturer training before operating a waterjet system. Training addresses three areas: software programming, equipment operation and equipment maintenance. The level of training depends on the number of variables including operator skill level and mechanical aptitude. The complexity of the waterjet system and the amount of additional accessories may impact the depth of the training and the time required. The average training program lasts three to five days. Each style of waterjet system requires different maintenance protocols. A system that provides the same power at the nozzle using a lower-pressure pump will require less maintenance and replacement of high-pressure components than will a system using hyper-pressure. A pump may deliver 55,000 to 60,000 psi, but it may not be economical to run at that pressure. The higher the pressure the more wear you will experience to the seals, check valves, swivels, on/off valves, hoses and other components. It is important to follow all equipment-manufacturer-prescribed maintenance intervals and procedures to prevent unplanned downtime. A majority of waterjet-system manufacturers suggest cleaning the equipment after each use or at some specified interval. Repairs and maintenance procedures should be conducted in a clean environment. Direct-drive pumps, compared to intensifier pumps, are simpler to understand, troubleshoot and maintain. One style of pump can have a preventive-maintenance interval of as long as 1000 hr. Shops should regularly inspect pumps and the high-pressure plumbing for leaks. If a leak is found, fix it immediately—a leak allowed to continue at high pressure can quickly erode and damage the system and may not be repairable. 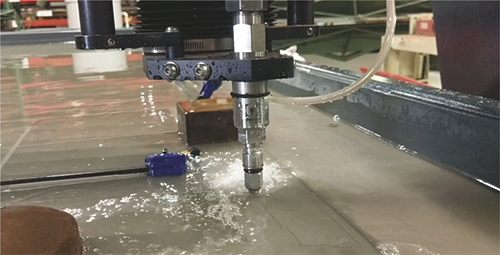 Tables with traction drives, specifically designed for the wet, abrasive-laden waterjet environments, do not require lubricants. This enhances system reliability and reduces the time and money required for maintenance compared to other linear-drive systems. Inspect table slats for wear at least once per month and replace weak or worn slats. Regularly rotating the slats to different locations on the table can greatly increase the life of the slats, as will the use of high-quality garnet. We recommend the use of high-quality abrasives, kept dry and free of debris. Dissolved solids can be removed from the inside edge of the nozzle’s jewel orifice by using an ultrasonic cleaner containing white vinegar. In addition, keep the diamond jewels clean to maintain optimal performance. Abrasives and material particles should regularly be removed from the tank. A solids-removal system will do this automatically, eliminating downtime incurred during manual cleaning. The filter screen for the tank’s water outlet also requires cleaning. Really informative article on applications of high pressure water jetting systems and how it should be maintain so it can provide longer service life.